Wild Turkeys are able to make several varieties of sounds. The following are primary wild turkey calls. Each of these sounds carry unique message. The big and spectacular birds are increasingly common sight and flocks stride around woods as well as clearings just like miniature dinosaurs. The following are their calls and what they mean. This is single note, basically associated as alarm. It could be different notes, rapid or sharp fashion, and normally meaning they have heard or seen something which is, danger. Another of the turkey calls is called a tree call. This is generally a series of soft as well as muffled yelps given by roosted bird. Often, it picks in volume as the fly down time approaches, sometimes accompanied by a soft clucking. It’s generally taken as call to communicate with the others in a flock. Wild Turkey will also make this basic turkey sound. It’s normally delivered in series of some single note vocalizations, and might have several meanings, depending on how the bird uses it. The cutting is a sequence of loud, fast and erratic single notes. It is a modified cluck, and is a unique call with somewhat questioning nature. It may be heard from far and is sometimes used by one wild turkey that’s searching for companionship. This is another of the turkey calls which is a sequence of loud yelps made to assemble young poults or her flock. This type of turkey sounds are generally linked with movement. It may be heard when the wild turkey is flying down or up from a roost, across a creek or off a ridge. The sound normally comprises of three to ten irregularly spaced notes. This is a movement call which is sparingly used. The Kee Kee run is the young turkeys’ lost call and variations made by adult turkeys. Often it’s linked with fall hunting, though it may also be successfully used during spring. This is how it sounds like, though a variation of this call, called kee kee run is just a “Kee Kee” with a yelp. This is a soft and rolling call the turkeys make when they are contented. It may be normally heard by feeding birds. It’s not loud call. This kind of turkey sound is single note, or notes, normally linked with flock talk, and that feeling of contentment. Often, it’s amplified. It’s a cluck and followed by a rolling which is almost a staccato. This is among the major sounds of male wild turkey and is used basically in the spring to let the hens be aware he’s in the area. 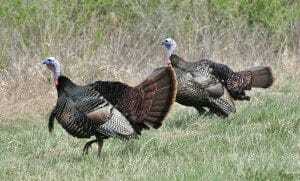 Download and learn Wild Turkey Sounds to use for your hunting or wildlife watching. Can be easily added to your sound device or electronic call or just use them as a ringtone.